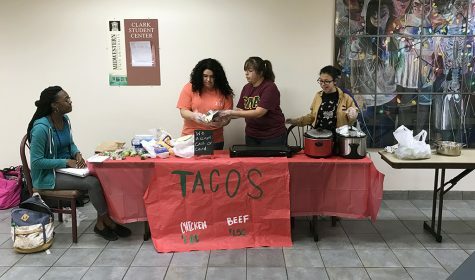 Sigma Lambda Alpha will be hosting a taco sale Oct. 30 from 11 a.m. to 2 p.m. in the Clark Student Center next to Chick-fil-A to give potential new members a chance to fundraise. The newest PNMs for SLA will be selling chicken ($1) or beef ($1.50) homemade tacos. Along with the meat for the taco, the PNMs handmade salsas to add to the tacos, but the corn tortillas were not homemade. SLA is known to sell some type of food item at least twice a month promote the awareness of breast cancer as well as celebrate milestones within the sorority. However, this food sale is not to raise awareness. Yerasly Duran, potential new member director said this taco sale is being put on to raise money for the potential new members. It gives them the opportunity to execute one of the focus points within the sorority, fundraising/charity. Along with fundraising, the PNMs, who have to remain anonymous until “crossing-over” into the sorority through a special ceremony, are hoped to have learned more about the sorority’s values as they continue through the five to seven weeks of recruitment. Due to them having to remain anonymous, the “actives” of the sorority will be the ones actually selling and handing the food out. Originally, the PNMs came up with up with the idea of a “spooky bake sale” that included homemade baked goods such as cupcakes and cookies however, Duran said she told them bake sales typically don’t go so well, Sigma Kappa had a bake sale this past week and only got a small return for their efforts. Duran said she suggested a “Taco Tuesday” instead to hopefully see a better profit. Duran said the sorority really hopes to see a lot of people buying tacos and they encourage people to come to events later this week and in November. Two weeks ago when the sorority hosted a burrito sale to raise money for the sorority’s funds, they spent $37 on supplies and profited $300. Also in the same week they hosted a fundraising night at McAllister’s and profited $25. Nov. 1 – Gordita Sale 11 a.m. – 2 p.m.
Nov. 5 – Señorita study session 7 – 10 p.m.